Holly brought her brand-new baby, Blake! Congratulations, Holly and family! 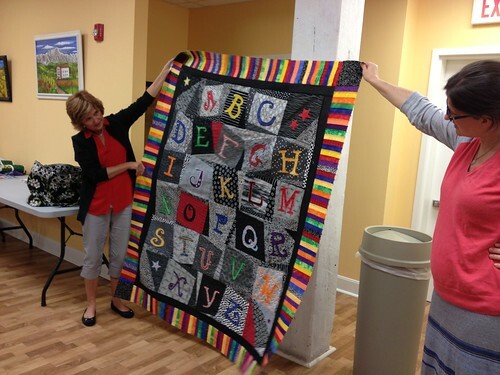 Two months ago we had two people here from the Cincinnati Museum Center working on a Cincinnati community quilt project. This project has been canceled. 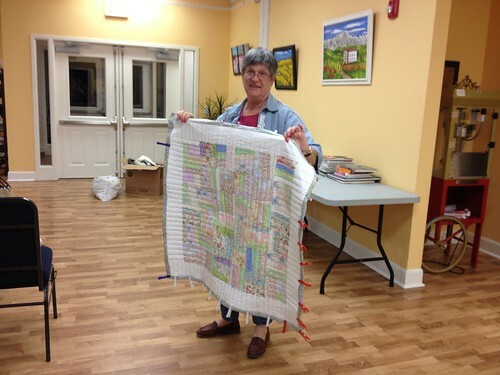 Carol made a Cincinnati block, and if anyone else made one, we can turn them into a quilt or a fundraiser or some other project. Carol mentioned that the Sunday paper did have an article about a quilt history exhibition at the Freedom Center. Our fat eighths for the Riley Blake fabric challenge fabric are here! We have eight different prints, and they are all basic prints that can easily be paired with other fabrics. For this challenge, you can add any other solid fabrics and any Riley Blake prints (solids = any manufacturer; prints = Riley Blake only). Deadline is (see update below). 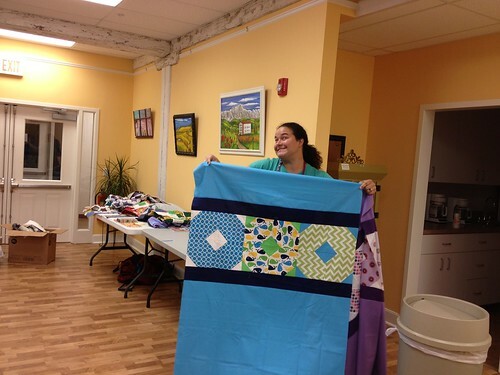 You can make any project you want to make—it just has to be a quilted project. Remember to take pictures and upload them on our MQG group site, Flickr, etc. Use the hashtag #mqgrileyblakechallenge for Instagram and Twitter. Completed photos must be posted in the Finished forum here. 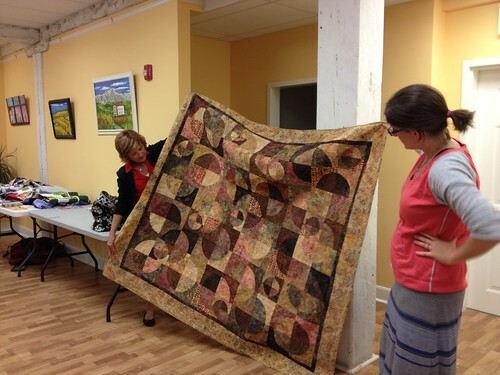 Members can make anything they want as long as it is quilted. Add in any solid fabrics or Riley Blake printed fabric. 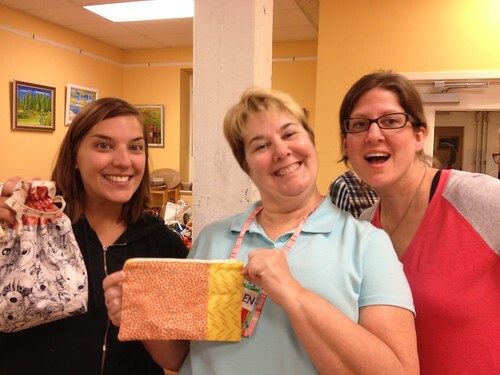 Upload and share your photos to the Fabric Challenge Forum on the Community site here. Ten finalists will be announced February 19, 2014. Riley Blake will pick three winners and announce the finally winners on February 24, 2014. Sunday, October 20, is the barn’s fall festival, and our guild is a big part of it this year. Our quilts will be on display in the center of the barn, and we will have a craft table too with items for sale for a fundraiser. The festival is from noon to 5:00. Gillian, who works at Half-Price Books, has found a lot of inspiration in the modern quilting movement via books. Some really good books are published by smaller presses and therefore aren’t as well known as other titles, so Gillian discussed the idea of a modern quilting library for our guild. We could check out a book at one meeting and bring it back to the next meeting, so we would have a book for a month at a time. Anyone who would like to donate a book to the guild for the library can do so. If you would like a specific title for our library, let Gillian know, and she’ll see if she can get it. Gillian passed around a whole bunch of books for everyone to look at. We’ll start the library next month. We have a new batch of CMQG promotional cards. These are helpful to give to people when we’re talking about modern quilting or our guild, so that people have something to see about the guild. Please take a few to have on hand to give to others who are interested in the guild or in modern quilting. The Portland Sew Down does have a few spots left. The Nashville Sew Down, scheduled for April 11–13, 2014, is not open for registration yet but will open this month, in October. This would be a great event to go to since it’s the closest one to us. If you have not yet received an email from Jessica about the MQG website registration, please let her know so that she can add you to our membership. We have a forum there specifically for our guild, where we can post pictures, ask questions, and connect with each other online. On the MQG website, first log in, then click the Groups tab, and then scroll down to the Cincinnati MQG. Click that link, and our discussion threads will be visible to you. 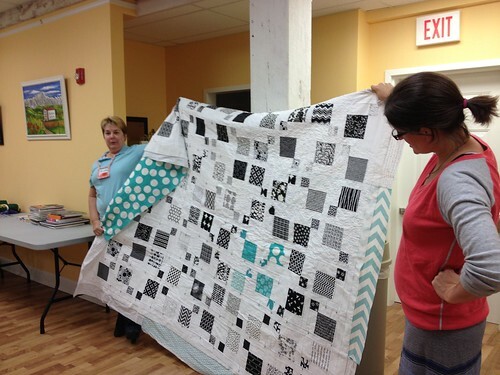 Cass presented several different quilt-as-you-go techniques that she has learned over the years. Quilting as you go is most beneficial when you have a small domestic machine and have a difficult time quilting a larger quilt on it. 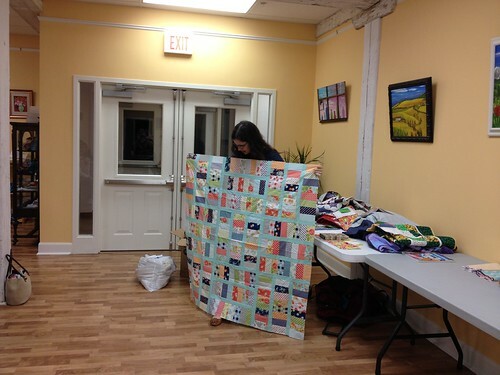 With quilting as you go, you make a block and quilt it, one at a time. 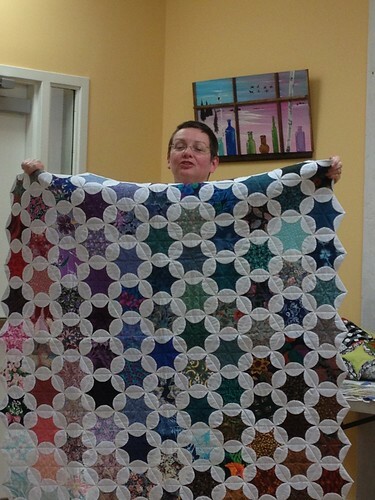 When all the blocks are completed, you join them together and your quilt is done! 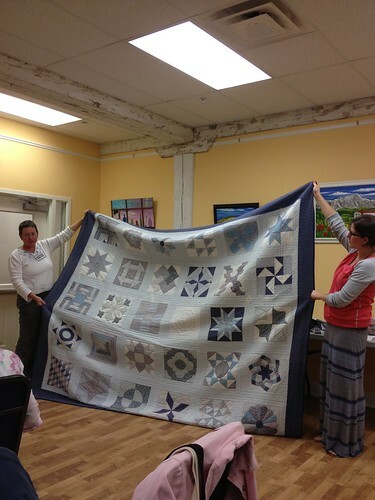 The first technique is to sew, quilt, and bind one block at a time, and then whipstitch the blocks together by hand to make a full quilt. 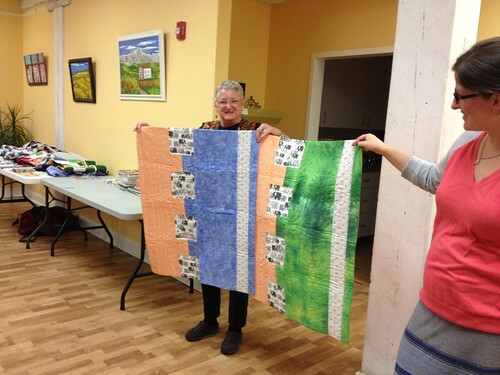 You can also piece as you construct a quilt, as Janine did with her cathedral windows quilt. When you sew the circles together, you’re assembling the quilt. Joyce used this method with a hexie-shaped quilt block and batting and a flower-shaped backing piece. Then the background is flipped over to the front, concealing the raw edges of the front fabric and the batting. The edges are turned under and stitched onto the hexie to make one complete block. She hand quilted each hexie, but the quilting and even the sewing of the backing piece onto the front could be done by machine. Then the blocks are whipstitched together. Cass made a Christmas quilt for her grandmother. 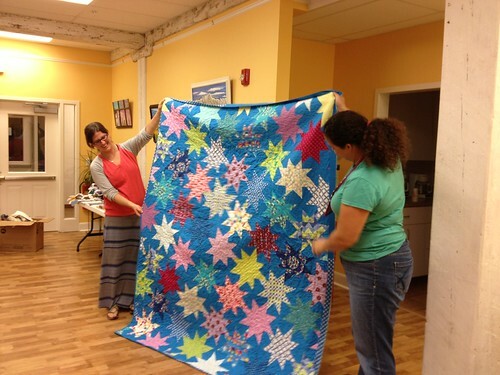 Each block was constructed individually, like her all-blue quilt-as-you-go quilt. With this method, the front of the block is smaller than the back, and the batting is the same size as the front. Sew the front together just as you would anything else, holding the batting and backing back. Then you turn under the raw edge of the backing and hand stitch it down to cover the raw edges. The Six-Hour Quilt is done using the front and back pieces with a strip of batting in between. Layer it so that the next backing and batting are sewn, then serge or stitch around the raw edges so that it doesn’t keep shifting. These are big six-inch strips of fabric, so if you’re going to wash it a lot, you’ll want to quilt it more. 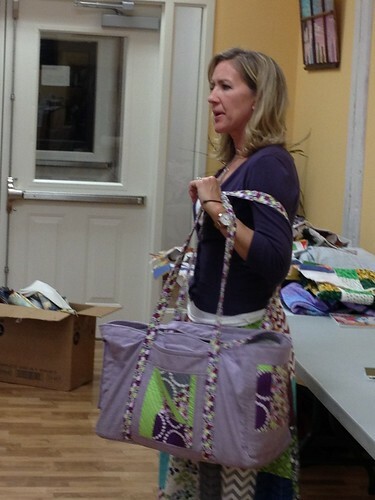 Nancy Zieman talks about using flannel instead of batting and then uses smaller strips. 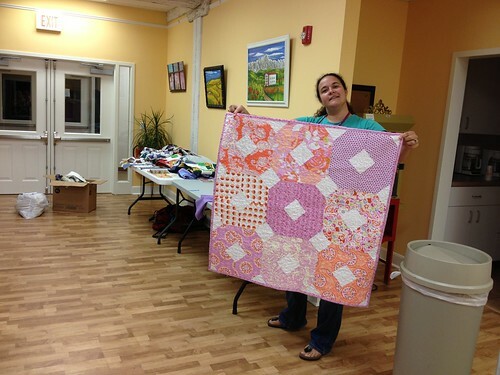 She quilted flannel to both the front and the back, and then sews them both together. She also suggests pinking the edges to reduce bulk in the seams. In Machine Quilting Unlimited magazine was an article that has a strip-pieced unit, then adds a piece folded in half to cover the raw edges. Another author in the same magazine used a wider sashing. On the front is a single layer with the sashing attached to each block. Add a strip of batting to the sashing, then add the sashing to the back, enclosing the raw edges and the batting. You might need to quilt that so the batting doesn’t shift. A similar method is to add sashing to the front, add the batting, then add the sashing again to the back but machine stitch it down using a wide stitch all the way down to catch the batting in the seam. The cotton theory is this—leave about an inch unquilted at the end of each block, then turn it back and sew down the flange with a decorative stitch. This method adds some texture to the back also. Everyone who brought a bag to swap drew a number from a bag and exchanged the cutest small bags ever! Next month: Ugly Fabric Challenge. 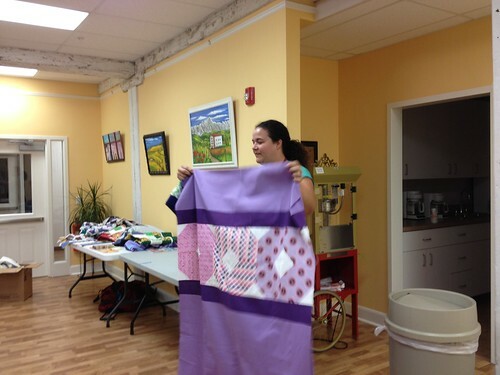 Make something out of an ugly fabric that you’ve had awhile or just don’t like and bring it to show off at next month’s meeting. Christy brought four amazing, colorful projects. We all loved the beautiful colors of the solids she used in each project. The first two quilt tops are for twins, her niece and nephew. and then her daughter’s quilt that she’s been working on awhile; it’s Elizabeth Hartman’s Sparkle Punch pattern and is backed with a thick, fuzzy minky-like fabric (that Christy hated quilting but loved binding). 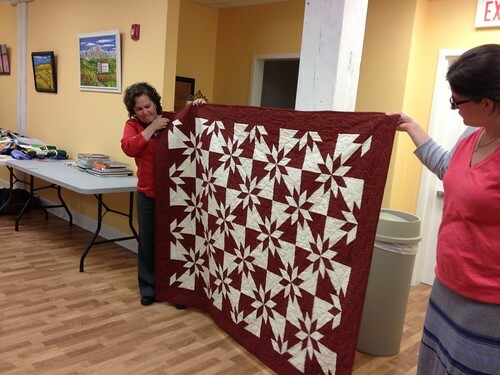 Caroline brought her finished Hunter Star quilt. 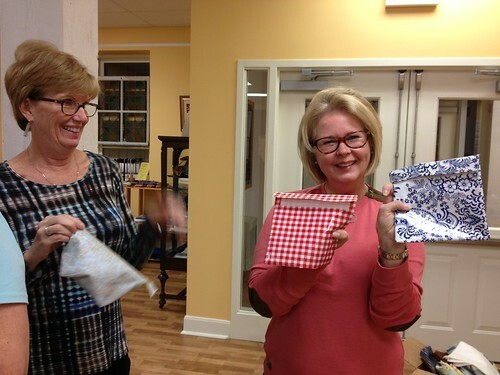 Carrie and Connie made charity quilts for the same group for Good Sam. Carrie brought two colorful baby quilts. Connie brought a cute baby quilt for the same group. 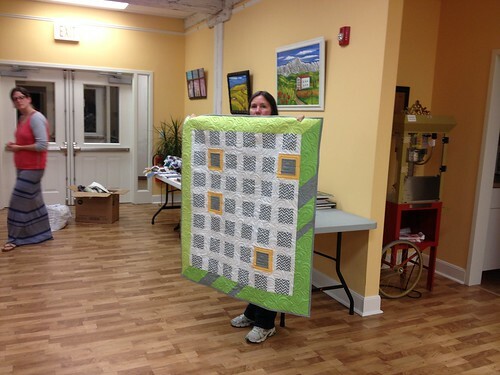 Brenda was inspired to make a scrap quilt—this is made from entirely scraps. 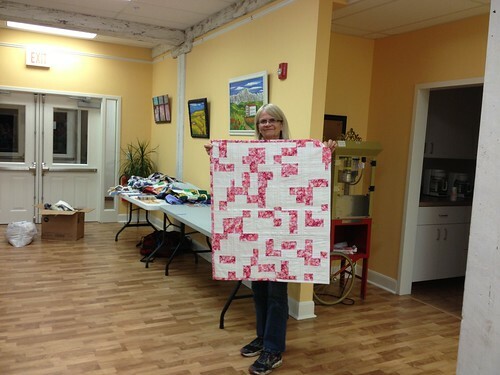 Ellen brought a do good stitches quilt that is almost finished, that she brought one quilt block for last month. It is a disappearing nine patch with a strip in between. 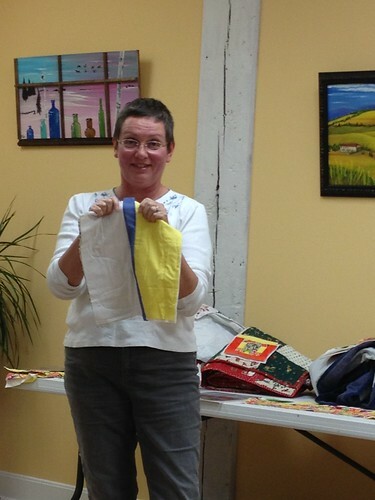 Michelle modeled a handmade skirt while she showed a Circle Sewing Tote from Elizabeth Hartman. It has a zillion pockets, which are really nice (now that it’s done!). It has both short handles and long handles and holds a ton of stuff. and one that she quilted for a friend of hers who made it. Andie made a sample New York Beauty block that she made for a class that she’s teaching at Sewn Studio on two Tuesday evenings, November 12 and 19. 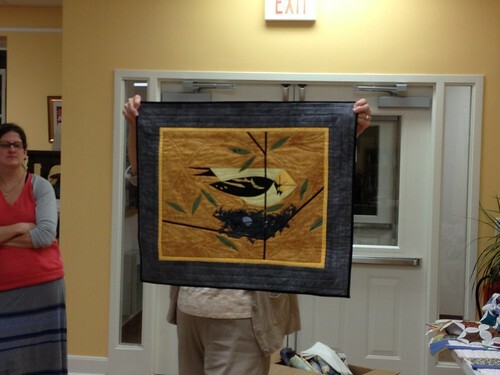 Kathy received permission to make a Charley Harper quilt. It uses a combination of techniques, including raw-edge appliqué, and satin stitch appliqué. 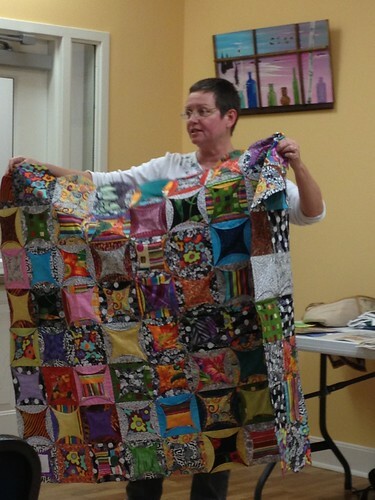 Gillian brought a quilt top she made from the Happy Go Lucky line of fabric by Camille Roskelley. The aqua sashing is perfect! 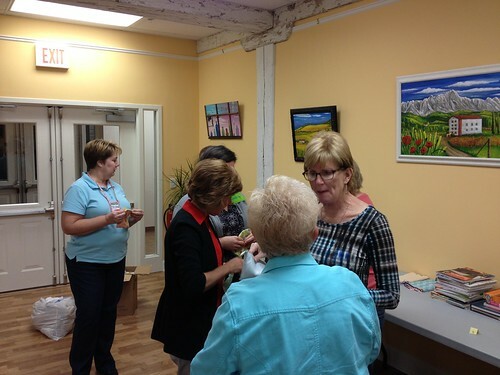 Next month’s meeting is November 13. Bring the project you made for the ugly fabric challenge and anything you want us to ooh and ahh over!